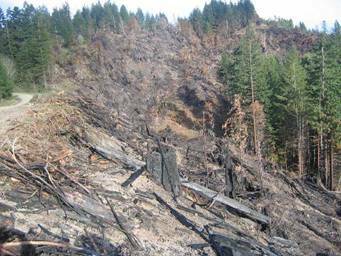 What are the cumulative impacts of timber harvesting in the Van Duzen, Hely Creek Planning Shed? Cumulative Impacts are defined by the California Forest Practice Rules: “ Cumulative Impacts are two or more effects which, when considered together, are considerable (significant) or which compound or increase other environmental impacts. The cumulative impact of a project is the change in the environment that may result from incremental projects impacts when added to other closely related past, present, and reasonably foreseeable, probable future projects. The significant adverse cumulative impact issue is not whether a past cumulative impact may have occurred, but whether the incremental effects of a proposed project, in combination with others, will result in significant adverse cumulative impacts. The Hely Creek Planning Shed has seen a tremendous amount of timber harvesting activities in the past 6 years. What is the disturbance index for Hely Creek? Why has it been allowed to become so high? What are the further mitigations that need to be addressed in order to maintain this watershed, and to not allow its continual deterioration? What is the limit for harvesting in a watershed? What are the limits for the Van Duzen? What percentage of a watershed can be harvesting without causing irreparable damage? Why are timber harvest plans continuing to be considered on an individual rather than a watershed wide basis? “An agency must examine impacts against the backdrop of cumulative conditions… in considering whether a project’s impacts are cumulatively considered, an agency must not ignore the impacts of past, present, or future projects.” (CEQA guidelines 15064, subd. (b) Kings County Farm Bureau vs City of Hanford, 5th district 1990. Yellow lines delineate Planning Watersheds. From left to right Cummings Planning Watershed, Hely Planning Watershed, and Stevens Creek Panning Watershed. 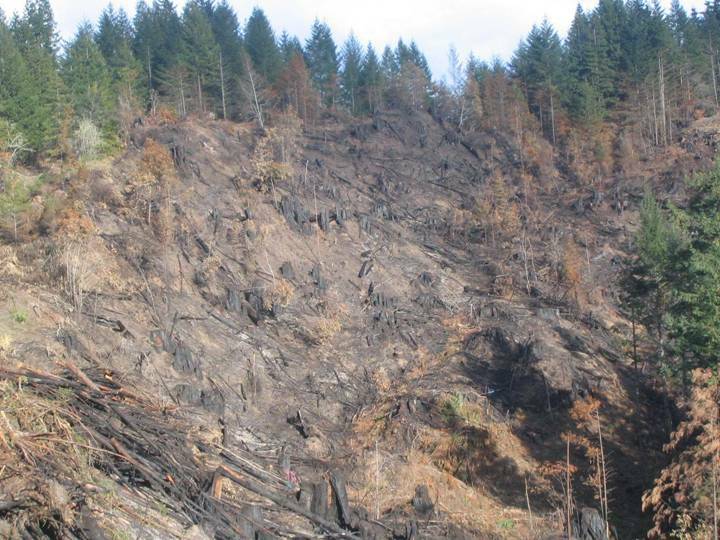 Timber harvest acres harvested, approved, or in process 1999-2005 : over 10,000 acres. 42-45%. Hely Creek is the only major creek that flows all year round within 5 Planning Sheds designated above. Yager has been going underground since 2000, Grizzly has gone underground for longer, and Cummings goes underground. These are the 4 major tributaries of the lower Van Duzen. Head of Hely proposes timber harvesting in the headwaters of Hely Creek. Approval of this plan, 04-238, in this sensitive zone, will endanger the continual free flowing aspect of Hely Creek. Rainfall retention of trees in the far reaches of Hely Creek help to maintain the integrity of this river system. Past plans such as the Achilles Hely Amendment 1-02-Am12 is also in the high reaches of Hely Creek and fills in the area surrounding the “fingers” in the right center of the blue graph enclosed. New plans Parsnip 1-05-053 are also alongside Hely Creek and in the same quadrant. Hydrological peak flow activities should be studied in relation to this plan and the other cumulative past, present, and future plans alongside Hely Creek. Approval of THP 04-238 and the continuing approval of new plans alongside Hely Creek will endanger the future ability of Hely Creek to maintain its integrity as a year round creek. From April 2004 – April 2005, over 1200 acres of plans have been approved along Hely Creek. With reduced buffer zones from the Watershed analysis, there is insufficient protection. Timber harvesting 51 feet from this major tributary is a destructive act, and the subsequent discharge of sediment into Hely Creek imperils its very safety as a free flowing, salmon bearing creek. For the past five years, Friends of the Van Duzen has maintained a water quality monitoring station at the mouth of Hely Creek in the Humboldt County Parks. Our studies have revealed high turbidity levels, which impede the ability of salmon to survive. As shown in the flow and turbidity summary graphs, change in turbidity level shows a general influence from fluctuations in flow volume. This indicates that turbidity data is consistent with precipitation effects. Turbidity values remain at very dangerous levels, even when flow is lower. 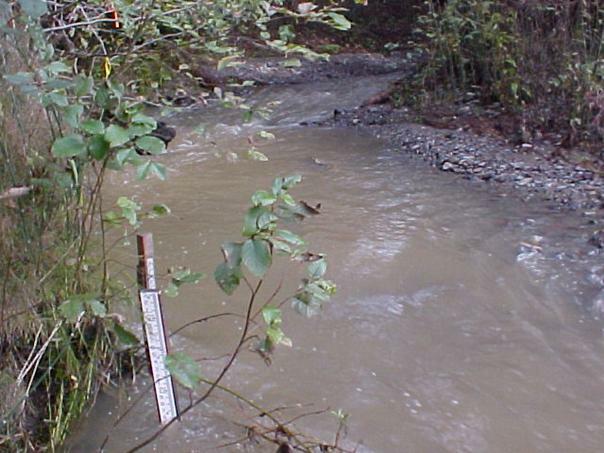 Turbidity sample values in the area of the lower Van Duzen watershed consistently show exceedence of levels shown to impair the lifecycle and survival of the coho, Chinook, and steelhead species. Many of these values are 6 to 10 times above the highest exceedence threshold. Negative impacts of potential beneficial uses of waters including the impact on threatened species and impact on spawning and early development are occurring due to this high sediment load. Much of this sediment load could be controlled by decreasing the impact from management related input, which has been shown in the previous Pacific Watershed and Tetra-Tech reports to account from 36% to 29% respectively. This leads to the conclusion that waste discharges are significantly causing and or contributing to the impairment of water quality and beneficial use. Streamside landslides accounted for 20% of the management related input. Since this is the highest portion of the 29% controllable input, it is most important to focus on reducing. This would include but not be limited too increasing size and density of riparian buffer zones until this input is reduced. To monitor the effect of needed improvement and reduced impact of management practices, the data collection effort must continue to be expanded with the end result of restoring water quality and beneficial uses of the Van Duzen Watershed. Hely Creek has historically been a salmon-bearing stream. Friends of the Van Duzen conducted oral histories and submitted them for the Tetra Tech/Palco Watershed Analysis. In November 2000, Oral History #4 by Jim Johnson, a local resident and avid fisherman, he states the following regarding Hely Creek. “Hely Creek is a good size creek that’s right on Redwood House Road. I used to take my son up there, my oldest son. During the winter months, when the salmon were running, you could actually go to Hely Creek, and watch the salmon go up Hely Creek in fairly large numbers. There were some deep holding holes, you would watch the fish migrate up, you could actually get close enough to them to where going through the riffles, you could actually touch them. Hely Creek is probably one of the biggest disappointments now when you go walk it or look at it. It is tremendously filled in; there is a tremendous amount of debris that comes down the creek. Unfortunately, on a different subject, people have easy access to it, and dump a lot of garbage alongside that creek. We’ve had heavy rains, heavy snows that have dropped a lot of alders and a lot of things in the creek. There hasn’t been any attention paid to it since that point in time. I don’t monitor the creek daily but I always go by. I stop. I used to like to walk the creek. I haven’t seen a fish go up it in 5/6 years. I am not saying there hasn’t been but in the numbers 15 years ago. Fish counts produced by the Salmon Spawning Stock surveys by the California Dept.of Fish and Game from 1987 and 1988 show 42 chinook in 1987 and 47 chinook in 1988. 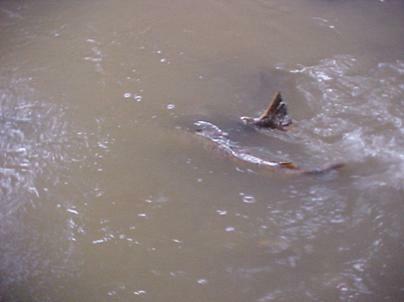 For the period 1989 – 1999, Fish and Game surveys show 1 salmon found in Hely Creek. 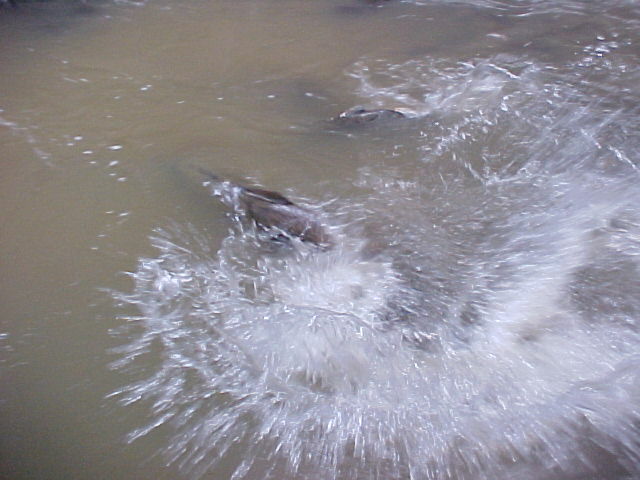 In Nov.2001, due to perfect rain conditions, Chinook salmon returned to Hely Creek. Friends of the Van Duzen members counted 36 chinook that year spawning and leaping in the Creek. It was quite a show! Since then, the Friends of the Van Duzen Salmon Watch program have not counted any Chinook coming up Hely Creek since then. Each year we clean the mouth of debris so that the returning salmon can gain access to their home creek. Enclosed are pictures of the Chinook in Hely Creek in 2001. What steps can we take as citizens and as responsible agencies to protect this endangered Chinook stock? and assist its possible return in 2005, and the future survival of the species in the Van Duzen? Approval of Hely 04-238, and future plans will imperil the remaining habitat for Chinook in Hely Creek. Where are the independent monitoring stations? Where are the turbidity and suspended sediment data? Why aren’t the agencies taking responsibility in this important decision making process? Where are Fish and Game fish counts for 2000-2005? Why is it up to private citizens to protect endangered species? 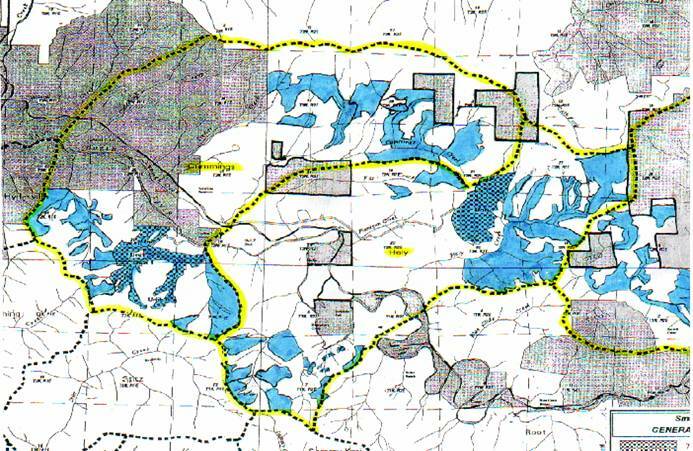 Plans for 25% of the Hely Creek Watershed in the last year from April 2004 to April 2005. Consistency to VR Option A document? On September 3, 2004, Head of Hely 04-238 was placed on a list of 15 plans designated as MiniOption A. At the 2nd review meeting for Hely 04-113 which I attended, Mr. John Sneed, Pacific Lumber Company, explained that MiniOption A was over their entire holdings. Since I had never had any opportunity to review MiniOption A prior to this meeting, I assumed plans were over PALCO’s diverse 211,000 acre holdings. Upon further review, I determined that 12 of the 15 were in the Van Duzen watershed. MiniOption A plans account for an additional partial cut of 604 timber harvest acres and an additional 1139 acres of variable retention for a combined total of 1743 acres in the Van Duzen River Basin. Almost all of these plans are in the already impacted Cummings Creek and Hely Creek sub basins with many plans adjacent to each other. The impact of further cutting in the Van Duzen using the silvacultural method of variable retention in young stands 35-50 years old does not establish maximum sustainable production over time. Option A” as PL is now trying to do. "We live in two interpenetrating worlds. The first is the living world, which has been forged in evolutionary crucible over a period of four billion years. The second is the world of roads and cities, farms and artifacts, that people have been designing for themselves over the last few millennia. The condition that threatens both worlds - unsustainability - results from a lack of integration between them. Now imagine the natural world and the humanly designed world bound together in intersecting layers, the warp and woof that make up the fabric of our lives. Instead of a simple fabric of two layers, it is made up of dozens of layers with vastly different characteristics. How these layers are woven together determines whether the result will be a coherent fabric or a dysfunctional tangle. We define ecological design as 'any form of design that minimizes environmentally destructive impacts by integrating itself with living processes.' This integration implies that the design respects species diversity, minimizes resource depletion, preserves nutrient and water cycles, maintains habitat quality, and attends to all the other preconditions of human and ecosystem health." So be it with Hely Creek!